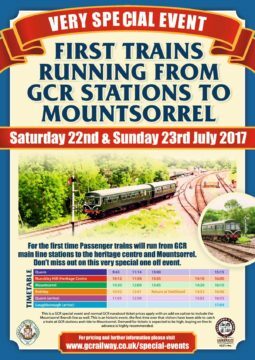 This is the first time ever that visitors will be able to catch a train at one of the GCR stations and ride through to the heritage centre and Mountsorrel stations, or vice versa. Although it was the aim of it’s builders in 1860 for the Mountsorrel Railway to carry passengers, those dreams were never realised. It has taken over 150 years for the 5th Earl of Lanesborough’s vision to finally be realised. Visitors over the weekend of July 22nd & 23rd won’t be following in the footsteps of those from a bygone age, they’ll be taking those first journeys and making history themselves! We all very much hope you enjoy making history over the weekend of July 22nd & 23rd! Remember that this is a one off special weekend and most likely will not be repeated for quite some time. Don’t miss it! The GCR will be updating their website with ticketing information shortly. The train times on the poster are for the trains running to the branch line only. 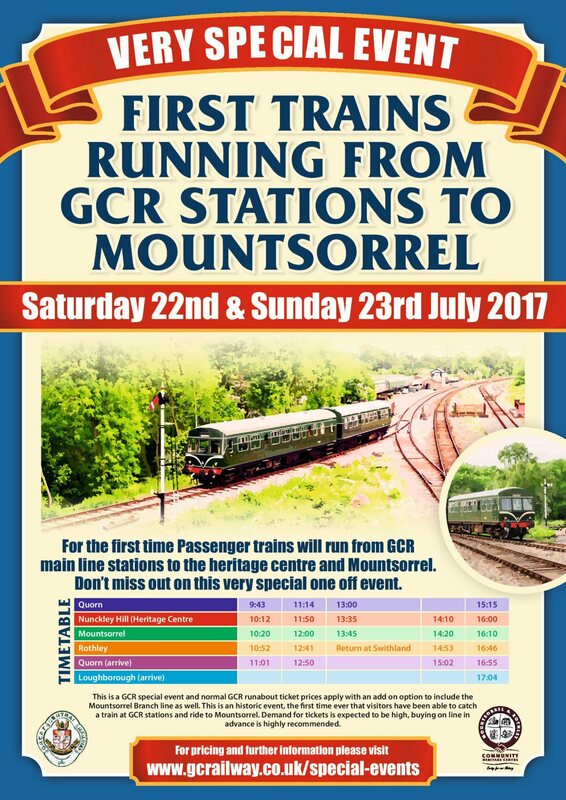 There is a separate timetable for GCR trains running on the main line as well as demonstration Travelling Post Office runs. We very much recommend buying your tickets in advance to avoid disappointment. The Garden Railway, including our own Thomas the tank engine, will be running at weekends (weather permitting) including the July 22nd & 23rd. Visitors young and not so can try their hand at driving one of the locos. For the heritage centre site to achieve its full potential we need new volunteers to join our team so we can open the new areas of the site as often as possible. Our garden railway runs on most Saturday’s and Sunday’s from 10:30 until 4:30, although we hope to run on weekdays as well through the summer school holidays starting on Monday July 17th. We currently operate 3 two hour shifts. The role includes running the model trains and taking the £1 fee from visitors wishing to drive an engine themselves. No previous experience of operating model railways is necessary. Training will be given on changing and recharging batteries and the other little tasks required to keep the railway running. We are looking for volunteers to play the part of a Victorian stone mason who would have spent their day sitting in their stone mason’s hut dressing stone into road cobbles, kerbs and the other items that the quarry used to make. Our volunteers won’t actually work the stone but they’ll be able to explain to visitors how the process would have worked, where to look for faults in the stone and how the stones would have been hit to split them. We have many examples of the finished products to show visitors. No prior experience is necessary as full training will be given. Prospective volunteers for this role would need to enjoy meeting and talking to the public. It is hoped to be able to operate this at weekends and on weekdays through the summer holiday. Since we opened the Railway Museum and Quarry Heritage Building at Easter we have volunteer guides around the site to open the museum in the morning, answer visitors questions and close up at the end of the day. There is a clear need to have volunteers in this role 7 days a week but at present we only have sufficient volunteers to cover a couple of days per week. Volunteers in this role would need to be personable and enjoy meeting and chatting to the public. No prior experience is necessary as training is provided. None of these roles are strenuous, or require physical activity, so would suit anyone of any ability. In all cases volunteers must be over 18 although younger persons are welcome to volunteer but must be accompanied by a parent or other adult. For example, a father and son combination would be fantastic for the stone mason demonstrations. In the late 19th century boys as young as 9 would have brought stone in the tub wagons for the stone mason to work. Equally a young person and parent or grandparent operating the garden railway would be a good combination. If you are interested in any of the above then please register your interest using the form at the bottom of our http://heritage-centre.co.uk/help-us/how-to-volunteer/ page. Thanks to our generous supporters we reached our target! The Great Central Railway’s Signals & Telegraph Department has been actively scouring various sources for all the bits and pieces that will be necessary to carry out the upgrade. A plan will be presented to the GCR’s Operating Department for approval before the final signalling scheme is drawn up. The required work is being fitted into the S&T’s busy schedule and is anticipated to commence later this year.